I have attached photos of deer damage from this fall and fall of 2013. There are also some photos showing how we applied Plantskydd. A short summary follows. 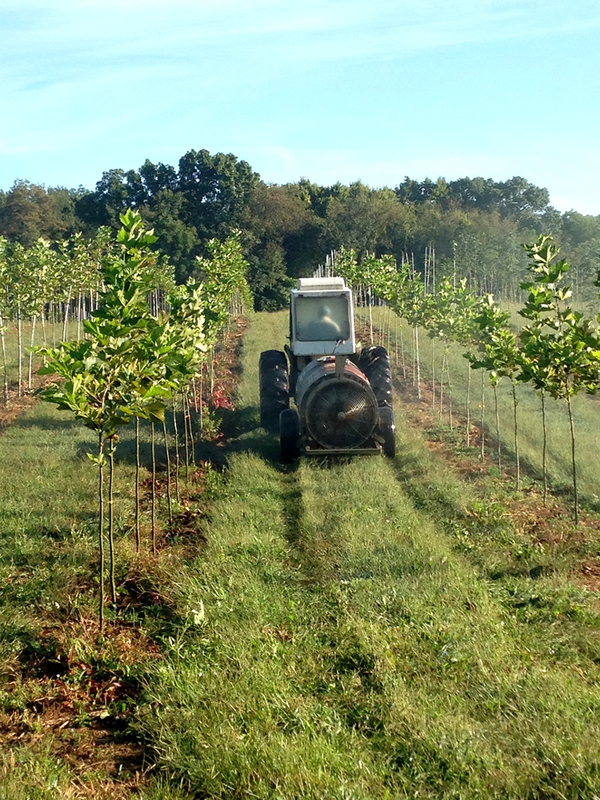 We are a shade and flowering tree grower located about 60 miles west of Washington D.C. in Berryville, VA.. All of the trees are field grown. We have about 150 acres in production. Over the years, controlling damage from deer antler rubbing has been one of our biggest challenges. Deer rub their antlers against the young trees for several reasons but the result is an unsaleable or dead tree. The economic impact can be great. 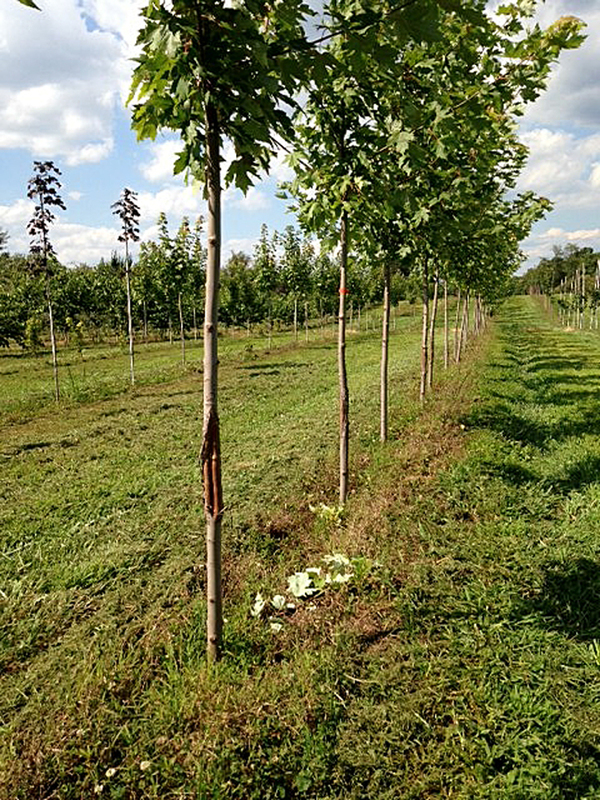 We typically plant about 10,000 trees per year. Five percent damage could result in a potential sales loss of forty-five thousand dollars or more from a single year’s planting. We have used dogs on an Invisible Fence system with some success to keep deer out of the farm but have never used deer repellent sprays until this year. A friend of mine mentioned Plantskydd to me so I looked into it and decided to try some this fall. Typically, deer rubbing begins in our area at the end of August or the beginning of September. We applied our first application of Plantskydd after we saw a few rubs the last week of August. We used an airblast sprayer directing the spray at the trunk of the trees. We applied 6 pounds of Plantskydd per sprayed acre. The recommended rate of Vestis was also included in the application. We saw an immediate stop of all deer rubbing for two weeks after the first application in the high pressure area. For another ten days there was limited rubbing but less than expected. The areas experiencing lower pressure continued to have almost no rubbing. We made a second application to the areas where the rubbing activity returned at the end of September. This was followed by an application in late October and a final application in November. Each time, following an application, the rubbing would cease completely and then return after about three weeks. It is important to note that the rubbing was still far less than we experienced in prior years under the same conditions when we were not using Plantskydd. In the low pressure areas, two applications four weeks apart kept damage almost to zero with only an occasional tree rubbed. We have found Plantskydd to be an economical tool to help control deer damage to our crop. It does not eliminate all activity but certainly significantly reduced the amount of damage that we have experienced in the past. We will continue to use Plantskydd next year. We have continued to spray Plantskydd Deer Repellent this year roughly following the same prescription as last year. We are learning when to time our applications and where to concentrate our efforts. All in all, the repellent spray program is showing to be a great investment and we consider it to be a valuable tool. Starting at the end of August, we broadcast spray our trees to prevent deer from rubbing their antlers on young trees. An example of older buck rub damage on shade trees. Our spray program did not eliminate rubbing damage completely but reduced it dramatically.